Looking over the movies I've watched last year, it would seem that I would prefer the heroic or the triumph of good over evil. I'm actually not as one dimensional as that. I can laugh at chick flicks like "The Devil Wears Prada" (though spousal input says at the wrong places), squirm at suspense, ponder "What Dreams May Come," or suffer through "Titanic" or, worse, "Sophie's Choice." Let's take the latter. "Sophie's Choice" is a very fine film. Terrific actress. Terrific story. I saw it when I was in high school, no doubt on a weekend. It's the kind of movie that makes you wantfor school to hurry up to lighten the load. Why go see "Rachel Getting Married," "Revolutionary Road," or "Doubt?" This is generally why I don't see movies that my Dad recommends. They may be various shades of worthwhile art, but should one seek a state of depression and call it "entertainment?" "Milk" or "Slumdog Millionaire" - okay, I get that there may be an interest topically or a well-constructed movie about something to which you would not otherwise be exposed, and at times I'll detour to such. That said, I like leaving the movie theater emotionally rewarded. Happy. I didn't leave "Quantum of Solace," the latest James Bond film, happy. The movie poster gives a clue. We're used to bond pulling out a small but effective Walther PPK. Instead, there's a shade of Rambo. First, I love Daniel Craig in the role. I used to think Sean Connery was the perfect Bond, and perhaps he's close. Roger Moore... He certainly had some enjoyable films (Live and Let Die), but his Bond remains more or less a known actor hamming a role. I never looked at him and said, "That's 007." Timothy Dalton... pass. Remington Steele... oops, Pierce Brosnan. Glib? Reluctant? Meeting expectations too perfectly? I don't know. But through them all, there's a few common denominators: Q's gadetry, the Bond women, rapidly changing (scenic) locales, paint-by-numbers plots, and a penchant for puns. "Casino Royale," which introduced Craig to the Bond role, may possibly be the best of all Bond movies. It scored on all the expected contents, and perhaps for the first time, introduced an actor who looked physically like he could indeed take on one or more bad guys. "OK, I'll say it. Never again. Don't ever let this happen again to James Bond...Please understand, James Bond is not an action hero! He is too good for that. He is an attitude. Violence for him is an annoyance. He exists for the foreplay and the cigarette. He rarely encounters a truly evil villain. More often a comic a opera buffoon with hired goons in matching jump suits." Well, that last immediately brings to mind "Moonraker," and I liked this movie far better than that. But he has a point. In this movie, Bond doesn't say a lot, there's ample tough action sequences, and it's humorless. Q, most recently played by John Cleese, is nowhere to be found, and the only gadgetry we find is a fairly rough and tumble car in the opening sequence. It was maybe a week after this movie that I settled my opinion on this movie, and that, itself is telling. 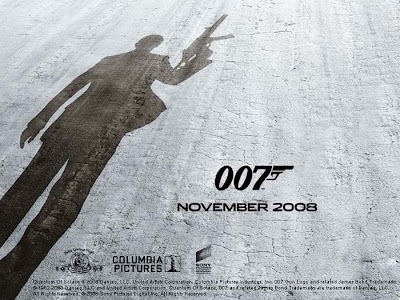 No James Bond movie should be a thoughtful endeavor, from the popcorn to the closing credits. But we come to this familiar character expecting familiarity. Here, we don't really know. Bond has never cared for a woman before. After all, each movie is out with the old, in with the new. Has the loss of his "love" in the previous movie really impacted his judgment? We don't think so, but we don't really know. He says little. He's gritty and determined. He's an efficient killer. Is there a rage beneath underlying his actions throughout the movie? Which makes one wonder. Character development is a strange detour to Bond tradition, and I wonder if it transitions to a new era of Bond or whether we'll return knee deep in Roger Moore's style of a wink and quip. I hope it's somewhere in between. In the meantime, I'd rather have skipped this one and gone immediately to what comes next. And left happy! Oh, and shaking camera effects during action scenes have got to go. Duh. I don't think I would like the Bond film either, but then I haven't liked any post-Connery Bond flicks. Have you seen Grand Torino? I will probably wait until I can get it from the library. What's the flick about priest abuse? That's another one I look forward to seeing someday. Yes, chick flicks elicit laugher from me too, but likewise at the wrong time. Gran Torina is on my DVD list when it escapes the theaters. I'm a sucker for Dirty Harry, even if he doesn't carry a badge in this one. As for the other, Streep and Hoffman are, no question, amongst the finest actors in this generation. Prada or Tootsie, yes. Doubt? I doubt it. I'd struggle too much with "What's the motivation?" - Not of the the characters or the actors who chose the roles, but of the 3-4 others in the audience who are watching it. I didn't like the last Bond movie, so I didn't bother to see this one. Bond movies are, in my opinion, meant to be full of quips, wit and some action. Casino Royale took the action into violence territory. The scene with Bond in the chair being tortured was too graphic. Bond is an institution that should not have been changed. I believe this was a case of fixing something that wasn't broken. Bond filled a niche, and now it is trying to step out of that niche and could very well perish. As a female, I can agree that Bond is a sexist pig. But he was a loveable sexist pig. He was a charming bad boy with lots of fun toys set in exotic locales. It made a girl think he just needed the right woman. The new Bond is dark, brooding and simply too much trouble to bother. Just out of curiosity, did you ever see the first Casino Royale? It was more of a Bond spoof, but I can't help but wonder if they weren't trying to make sure that this Bond is 180 degrees opposite that Bond. I'll categorize amusements as being those things that I pursue that are thought provoking, fun, or otherwise enjoyable enough to bother writing about them, which is an amusement as well. Now accepting free concert tickets. Or other emails.